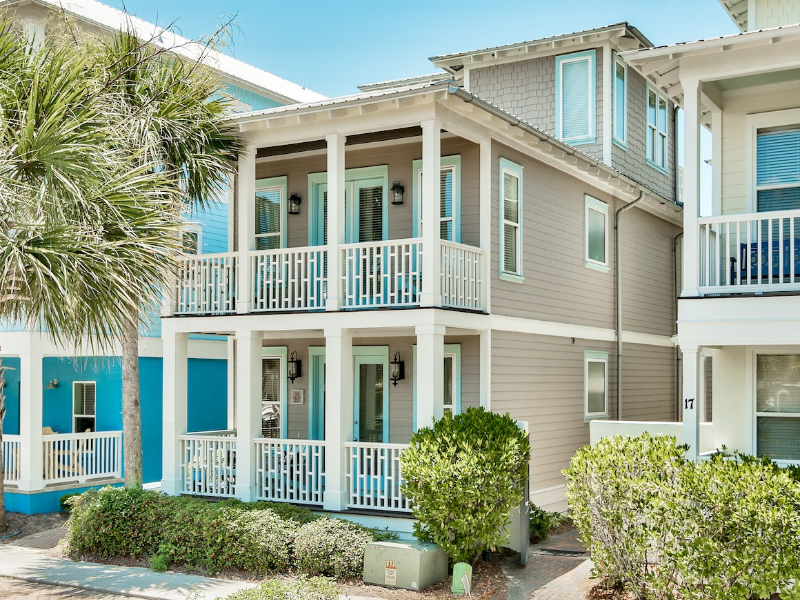 Sea Grace is new to the rental market and located in the popular community of Seacrest Beach. This charming 3 bedroom, with a bonus room, 3 bath home offers an inviting open floor plan with the main living area, dining and kitchen on the second floor. Situated at the front of the community this elegant home offers the best of both worlds – close to the beach and also just steps away from the stunning 12,000 sqft resort style pool Seacrest is known for. Hungry? You are just quick stroll from some of the best dining along Scenic 30A in Rosemary Beach. Grab coffee in Alys and a drink at Neat. Entering the first floor you will find 2 bedrooms and a TV/bed area. A king bedroom with private balcony and en suite bath on your right. TV area with stairwell entryway and on the left a bedroom with 2 Queen beds, en suite bath, and private balcony. The TV area is a perfect spot for kiddos to game while others are watching the living room TV upstairs. This area includes a Full size bed with a pull out single trundle. The second floor is the hub of the home with, living, dining and kitchen area, open and spacious with all you need to hang with your crew or entertain others who might be at the beach also. This floor has one king bedroom, private balcony and has a shared full bathroom. GULF VIEWS…. from the bonus room are amazing. This room also has 2 twin beds and it’s own private balcony. When you are ready to explore, you don’t have to go far for awesome shopping and dining venues in neighboring Rosemary and Alys Beach.